In this post I will show you, how to mount in your guitar a simple, but useful tone switch. This circuit can help you cut-off a little bit of high-end (high frequencies) from the guitar signal. It means, that your guitar tone will be a little bit fatter and more round after using the switch. It will not work just like a classic, potentiometer based tone control. It's more subtle, and it can be switched only on and off, by a toggle (there's no pot). The circuit is based on one SPDT on-on mini toggle switch and one capacitor. It's basically a low-pass RC filter. „C” is a capacitor, „R” is made from a guitar pickup. The circuit hasn't got a potentiometer. It can by just „on” or „off”. It this example it's an advantage. No potentiometer in a passive wiring, means no uncontrolled treble muffling. When the circuit of this kind of tone switch is off - there is no any affect from it. Potentiometers are affecting the signal even on „10” position. 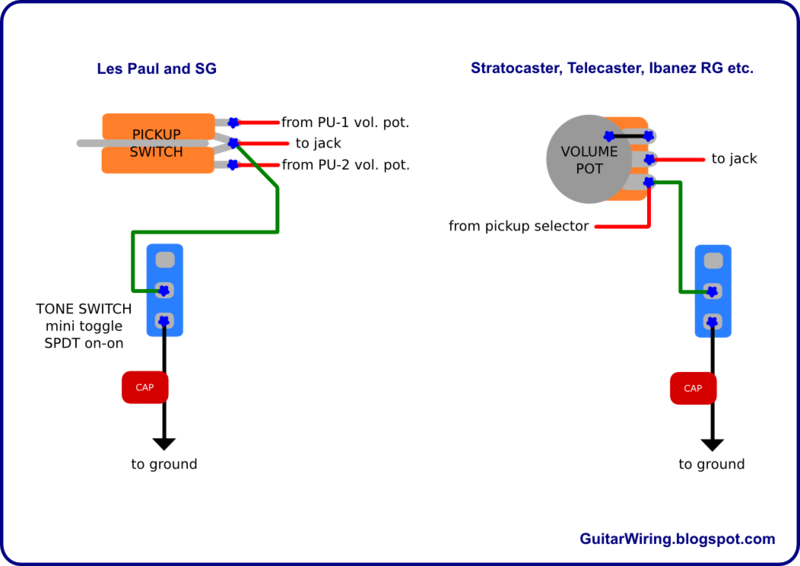 Remember, that the way of mounting the tone switch is based on a guitar wiring type. The diagram shows two, different, common ways. The capacitor is the most important part in this tone switch. You should chose a relatively low value, because the filter should acting only on really high frequencies of the guitar signal. Otherwise, your tone can be dull. For medium output humbuckers, like classic Gibson, I like to use 4,7nF. For a little bit hotter pickups 3,3nF can be good. Classic Stratocaster's single-coils can work nice with 5,6nF. Of course, this values are not critical. It's good to buy a few different caps, and make some experiments with them. There is also a possibility to make a switch based on two capacitors, like the Gretsch tone control. I like to use this kind of tone switches to get some more fat distorion, or for smooth clean tones from the neck pickup. It's quite simple mod. It's not expensive and almost anyone, who knows how to use a solder iron, can make it. With the right capacitor, it can be a very useful tool for you.